We continue to support voice changing on your Apple Mac with our latest release of MorphVOX Mac which has been tested and is compatible with Apples High Sierra (OS X 10.13). For more information regarding MorphVOX Mac, click here. 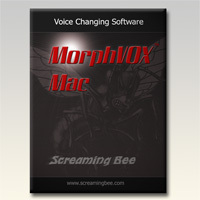 MorphVOX is a registered trademark of Screaming Bee Inc. Mac, Macintosh, OS X and Apple are registered trademarks of Apple Inc.